The 3rd party retailers have done their share of hand-wringing and clawed back up to full $80 from the already decent $199.99 AT&T is selling the most powerful phone to hit a US carrier for. 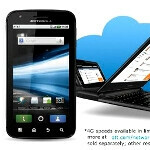 The dual-core Motorola ATRIX 4G can be had for just $129.99 at Walmart Wireless, if they can lock you into a two-year contract before Thursday, and $149.99 at Amazon Wireless. Of course, you have to purchase at least a $59.99 talk plan plus a $15 minimum data plan, or, if you want to use the dock, you have to shell out $45 a month for the Data Pro 4GB and tethering plan. The 4G capable device will set you back $499.99 if you want the laptop dock, which is the price of the dock sold separately as well, so obviously AT&T and Motorola are trying to make it really hard to purchase just the dock. The Motorola ATRIX 4G just got its root treatment yesterday, so you will be armed with all prerequisites of a great Android experience - high-resolution screen, powerful dual-core chipset, low price and... a laptop dock, if you are so inclined. Stay tuned for our review of the ATRIX 4G very soon. Played with the atrix and compared to my inspire and didn't see a difference honestly. Maybe in the long term the difference will be noticed. You can't beat $129 though. its 2gb for 25$. then if you add tethering for 20$ you get 2gb extra so the total is 4gb. Walmart reps do not always know what they are talking about. The data pro with tethering deal is 4GB, 45.00, for any qualifying smartphone, which includes many of the Blackberry, iphone and android phones. Its $119.00 new line or upgrades.. with a free case, car charger, and headset at Costco... Plus free activation on new lines!!! That place cant be beat!!! oh ya its instantly 119 no mail in rebate crap!! Can anyone confirm this? Do you have to be a new AT&T customer? I can confirm it too. it's $119.99 through Costco for existing customers too. just got mine today it is awesome! i got it for $199 at the ATT store and got the 32 micro sd card becasue it only comes with 8 that was $139. and the Activation fee was $18 so in all the phone cost me pretty much $370 with tax and stuff maybe more. Didnt buy insurance, hoping thats not a mistake.